NEW YORK-Fusion of East and West in a new exhibition at the Metropolitan Museum of Art juxtaposing influences of art, drawing and Chinese culture, from the time of Imperial China until the current period, to fashion and Western design. 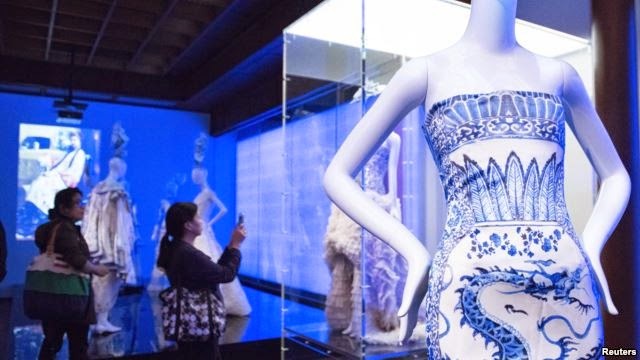 With 150 suits, dresses, costumes and accessories from 40 designer, is shown with the theme of "China Through the Looking Glass," which took place from May 7 until August 16, is one of the largest exhibition ever held of the museum. Created for more than two years, the exhibition is housed in the gallery two floors covering an area of ​​approximately 2,800 square meters. This event takes visitors on the way how the designers of the West find inspiration in everything from China, ranging from highly detailed embroidered costumes belonging to Imperial China to the Shanghai of the 1920s, and military uniforms Cultural Revolution. "This is a monumental and profound exploration of the effects of Chinese film art and talent to design Western fashion world," said Thomas P. Campbell, director and CEO of the Museum. This exhibition takes the title of Lewis Carroll's novel, published in 1871 "Through the Looking-Glass, and What Alice Found There," about entering another world. "As the imaginary world of Alice, China which is reflected in fashion in this exhibition fictional, stunning and ancient, offering a new reality," said curator Andrew Bolton, who added that this collective fantasy about China. This exhibition displays a treasure of China as a dragon robe, worn by the last emperor before he ascended the throne, and painting Chinese concubines who never exhibited before. A labyrinth featuring Chinese calligraphy, perfume bottles and blue-and-white porcelain, as well as patterned dresses, beaded dresses were amazing and jackets embroidered artificial Western designers who influenced Chinese culture. One room is dedicated to opium and China's influence on the collection of autumn / winter Yves Saint Laurent in 1977 with jackets and fur coats in the style of the Mongols. Part of the exhibition at the Metropolitan Museum of Art Costume Institute Gala Benefit in New York (4/5). 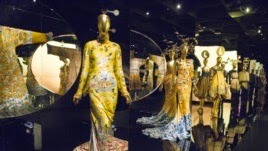 An oriental garden decorated mannequin mannequin-wear dresses, skirts and coats inspired by China-made John Galliano's collection of spring / summer 2003 for fashion house Dior. The exhibition also displays pieces of Chinese movies such as "The Last Emperor," "Raise the Red Lantern" and "Farewell My Concubine" which aired in the rooms along with Western clothes that inspires. "The films were often the first thing seen by the designers of the West when China entered the visual world," said Bolton. "This exhibition roam impact in shaping their fantasy films."